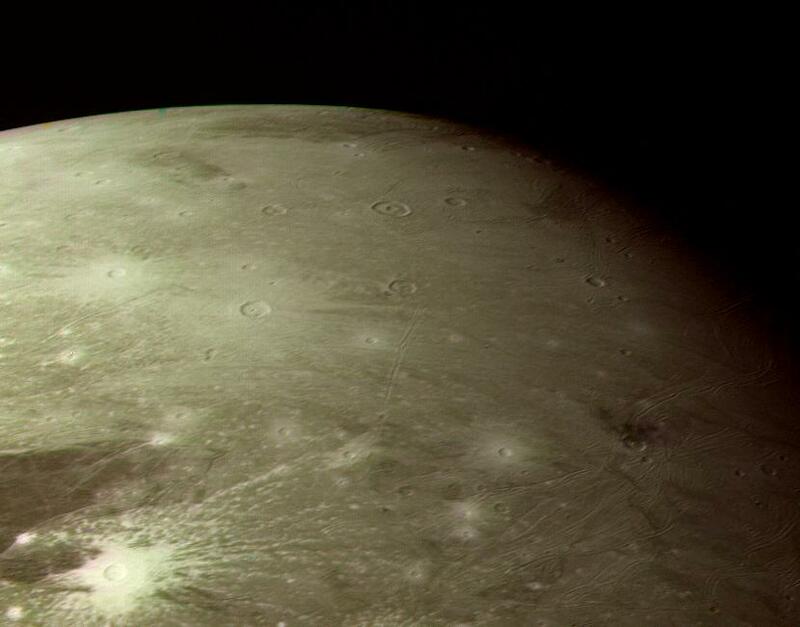 GANYMEDE COLOR PHOTOS: This color picture as acquired by Voyager 1 during its approach to Ganymede on Monday afternoon (the 5th of March). At ranges between about 230 to 250 thousand km. The images show detail on the surface with a resolution of four and a half km. This picture is of a region in the northern hemisphere near the terminator. 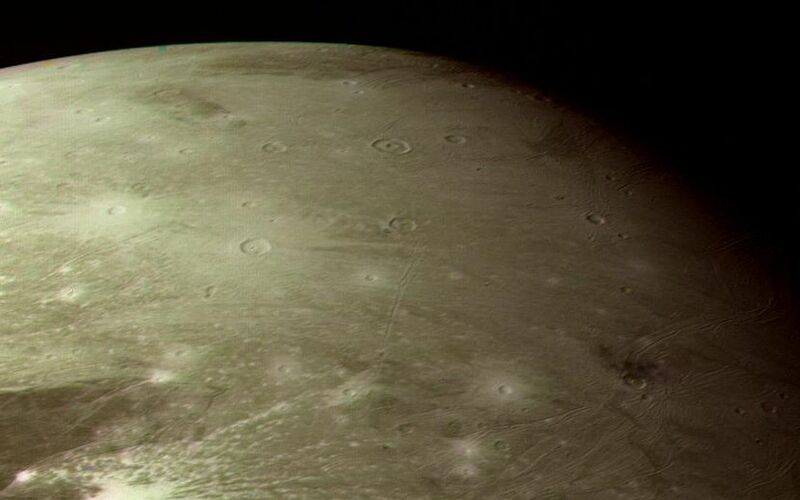 It shows a variety of impact structures, including both razed and unrazed craters, and the odd, groove-like structures discovered by Voyager in the lighter regions. The most striking features are the bright ray craters which have a distinctly 'bluer' color appearing white against the redder background. Ganymede's surface is known to contain large amounts of surface ice and it appears that these relatively young craters have spread bright fresh ice materials over the surface. Likewise, the lighter color and reflectivity of the grooved areas suggests that here, too, there is cleaner ice. We see ray craters with all sizes of ray patterns, ranging from extensive systems of the crater in the southern part of this picture, which has rays at least 300-500 kilometers long, down to craters which have only faint remnants of bright ejects patterns (such as several of the craters in the southern half of PIA01516; P21262). This variation suggests that, as on the Moon, there are processes which act to darken ray material, probably 'gardening' by micrometeoroid impact. JPL manages and controls the Voyager project for NASA's Office of Space Science.